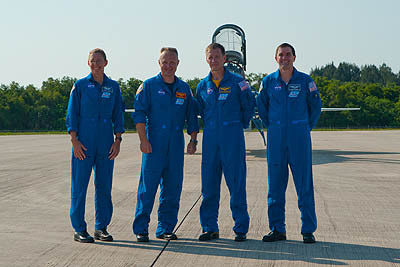 Commander Chris Ferguson, pilot Doug Hurley and mission specialists Rex Walheim and Sandy Magnus traveled today from their home base in Houston, arriving at the Cape in waves of T-38 jets just after 5:30 p.m. EDT. "I think I speak on behalf of the crew, everyone in the astronaut office and I'm sure everybody here at KSC, we're just trying to savor the moment," Ferguson told reporters at the runway. "As our children and our children's children ask us, we want to be able to say we remember when there was a space shuttle and like I said, we're savoring every moment, trying to take it all in and looking forward to an incredible mission." On Thursday, the crew boards Atlantis for a full countdown simulation. The astronauts will follow a normal launch morning routine with breakfast, a weather briefing on conditions at the Cape and various abort landing sites, then don their suits and depart crew quarters at about 7:45 a.m. to board the Astrovan that will take them to pad 39A. After reach the pad shortly past 8 a.m., the astronauts will climb inside Atlantis and strap into their assigned seats for the final three hours of the mock countdown. Clocks will halt in the final seconds to simulate a shutdown of the three main engines just prior to liftoff around 11 a.m. The crew egresses the shuttle and practices scurrying to the slide-wire baskets to finish the training exercise. After the TCDT concludes, the crew then returns to Houston to finish their training there. They will come back to Florida on July 4 to begin the real countdown. Atlantis is scheduled for blastoff July 8 to deliver a vital load of supplies and spare parts to the International Space Station during the 12-day mission that caps the shuttle program's 30-year life. Ferguson said his crew was "incredibly proud" to serve aboard NASA's final shuttle mission. As for the future using new commercial spacecraft and developing a deep space vehicle, he said "you can be absolutely sure of one thing. And that is, if you take the fact that we have been sustaining a human presence on the International Space Station for the last 10 years ... regardless of what transpires over the next several years, and we'll go through, I'm sure, a few gyrations, we're going to have a nice, solid program in place to go back and forth to the space station and then hopefully beyond low-Earth orbit."